When it comes to asking for help in business (life too, but that’s another article) many think it’s a sign of weakness. The biggest “I got this” is around customers. Now to make it fair, I was guilty of this too. I created my avatar… Buyer persona… I imagined, I gathered data from google analytics and I read reviews. The deeper I get into creating Hero Worship MarketingTM the more I see how important it is to have actual conversations with people. Guesswork doesn’t get us the information we need in today’s world of marketing. 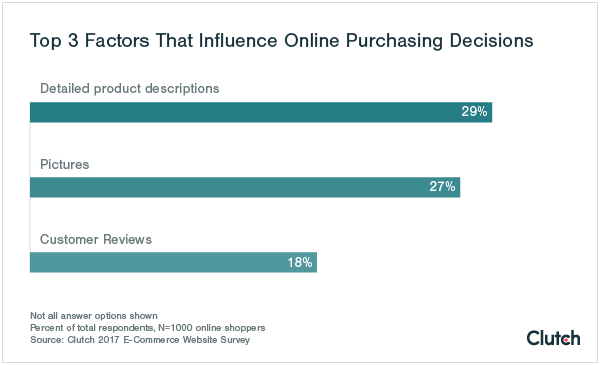 To help potential customers find the information they need, e-commerce businesses should keep product descriptions short and focused, using bullet points when possible. Detailed product specifications are the most highly valued factor in purchasing decisions. Data does not give us emotion. And data does not help us create empathy. Data is that framework to work from… Absolutely. In the research, how did they find out what people wanted and what was most effective? The conversations are what gives us the richness. That’s how we get to know what the problem is that our customers are facing. It’s how we get to understand what the potential consequences are if we don’t solve the issues or problems. This is not about persuasion. There’s a ton out there on persuasion and persuasive messaging. Even though it absolutely works to convert into sales, I’m not one of those that gets turned on by persuasive messaging. Persuasion can get you to buy something you don’t really need or want. I used to be easily persuaded until I ended up waiting for the product that doesn’t work or that didn’t take care of my need. BTW that’s when you need to take a look at the rate of return of products and services. Instead of guessing or using old marketing tactics, the thing that we need to do (and this is the scary part,) the thing we need to do most is ASK! This is not asking for the sale, let me get that perfectly clear. At this point we are nowhere near creating an offer asking for a sale. ASKING creates clarity. Asking is a strength not a weakness. For some reason, in all this cacophony, marketers still seem to think if they can stand on their tippy toes, and scream loudly enough (metaphorically speaking,) even strategically, they can get the attention of customers. What I’m going to tell you is how, with a quiet, almost hushed voice, you can break through that cacophony and communicate with customers so they feel like you’re talking to them and not at them. How can you NOT love this idea in today’s noisy marketplace – where everyone is screaming at you from the top of their voice! Interacting, communicating and simply ASKING customers for feedback is really pretty easy. Asking gives you exactly what you need to create messages your customers will read. Asking can be completely liberating for three reasons. It helps you really know your customer and what they want. It gives you the right kind of messaging for your marketing. It helps you build confidence and shed the fear of thinking that you’re an imposter. So, what do you ask your customers? First, keep your questions simple. When people see questionnaires or surveys in their inbox, they tend to run the other way. People already have busy schedule and the last thing they want is another thing on their to-do list. Make them fun and easy to answer. Of course you want to ask open ended questions because you get the most detail when people can pour their hearts out. Getting there, however, is strategic. Ask easy closed-ended questions first. Get your reader warmed up. Yes and No questions are easy and fast. Then go to 2 or 3 well worded open-ended questions that will get your reader to open up and give you what you’re looking for in their answers. Kissmetrics has an article that will help you form some really good survey questions. What’s your biggest challenge with _______________? When you wake up at 3 am, what’s whirling around in your head? What do you wish was out there (product or service) that’s not? There is an art and science to asking questions so you get the most out of the responses. But for your purpose, getting to know more about your customers, the best thing to do is go with your instincts and just ask. I would love to hear some of the questions you ask your customers that get them to open up and give you the juicy answers you’re looking for. I’d also like to know what some of your burning questions are that will help you get to know your customers on a deeper level. Leave in the comments below and let’s talk about it.